Whether you're an avid stationery fan, or you simply want to have beautiful personalised tags, cards or place settings this Christmas, you will have a chance with a 15 minute slot with Pricklepress at this years Babyccino Kids ShopUp. Take a break from your Christmas shopping and seize the chance to do something creative and put a personalised touch on your Christmas. 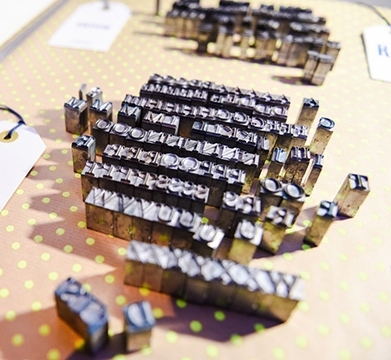 We are so excited to have invited Rachel from Pricklepress to run her popular letterpress workshop. Pop along and find her in the cafe where you will be able to choose from a beautiful selection of hand-painted cards , tags and place settings (in an array of gorgeous colours) and personalise them as you like. The letterpress is a beautiful old tactile craft. Each piece of card is fed through the press, piled, cut and enveloped by hand. The result is something you will instantly want to stroke, collect, frame or gift away. 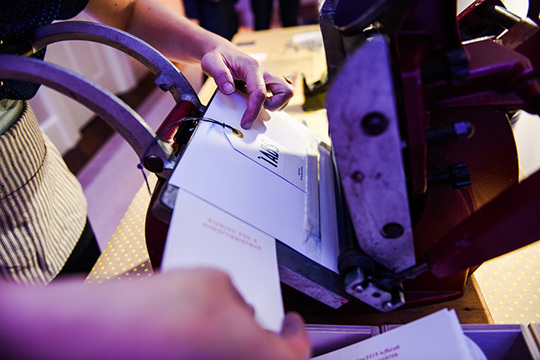 You will have the opportunity to see an old printer, personalise something and of course have a go yourself! No need to bring anything along with you other than idea of initials, names or messages you would like to press. Rachel will guide you with everything, and you will go home with beautiful personalised Christmas stationery. This workshop will be held in the Cafe area during the Babyccino Kids ShopUp. Places are £5 per person for a 15 minute slot. These slots are not bookable in advance, just pop along on the day. If you are on a tight schedule and know a specific time you would like to have slot, please do email us and we can arrange that (hello@themamahood.co.uk). Prickle Press is a design and letterpress business run by Rachel in the heart of Brixton, London. Prickle Press specializes in hand printed cards, prints and personalised stationery. Prickle Press unique designs begin as pen and ink sketches inspired by unassuming objects, characters and stories. Rachel turns her favourite illustrations into letterpress plates, choses a set of metal or wooden type and sources the most luxurious and forest friendly papers. Finally, each design is hand printed using a hundred year old 8x12 Chandler & Price treadle press.